Easily package to-go orders with this Fit Meal Prep kraft microwavable paper take-out container! Featuring an attractive and convenient design, this container is perfect for boxing up both hot and cold foods. Not only is its size big enough to house full meals, sides and desserts, its tab-lock top also ensures your signature items remain contained and safe from germs or airborne contaminants while in transport. 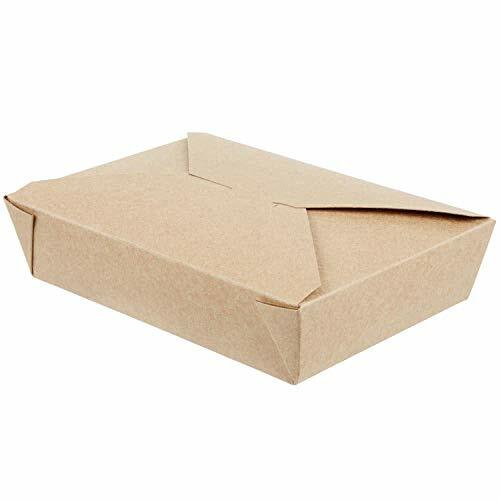 Made out of environmentally-friendly, chlorine-free kraft paperboard, this container ensures quality, single-service use and conveniently nests with multiple containers for compact storage. Its poly-coated interior also offers a grease-resistant barrier that prevents oil from soaking through and creating leaks or messes. Disposable for easy clean up, this Fit Meal Prep box is the perfect addition to any busy family, restaurant, convenience store, or food truck! Overall Dimensions: Length: 8"Width: 5 1/2" Height: 3 1/2"Capacity: 112 Ounce100% satisfaction guarantee - contact us if not satisfied with our product and we will send you a new replacement or issue you a full refund. 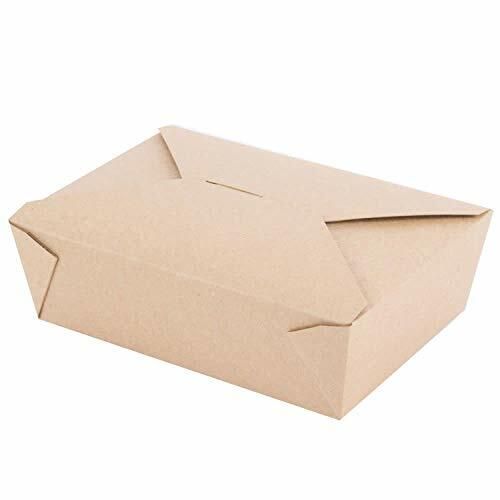 Paper Take Out Food Containers can be used in parties, BBQs, work or school lunches can produce a lot of plastic cutlery waste. 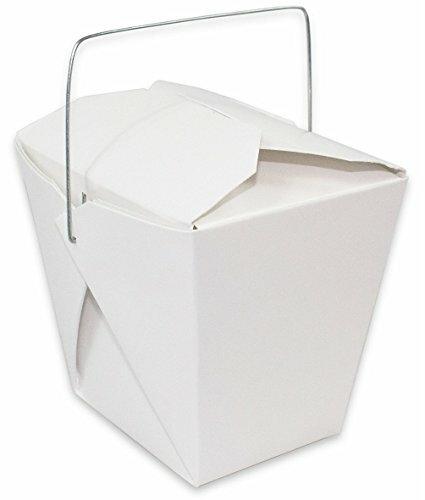 Reduce or eliminate this waste by using this disposable paper take out containers. It is designed for products containing fat, primarily in the food domain. Resistant to oil and grease and moisture-proof, it is suitable for any greasy food. Leak-proof that will not make your soups spill everywhere and will ensure that moisture cannot transfer between layers.Add to Cart now to get yours now!. Easily package to-go orders with this Fit Meal Prep kraft microwavable paper take-out container! Featuring an attractive and convenient design, this container is perfect for boxing up both hot and cold foods. Not only is its size big enough to house full meals, sides and desserts, its tab-lock top also ensures your signature items remain contained and safe from germs or airborne contaminants while in transport. 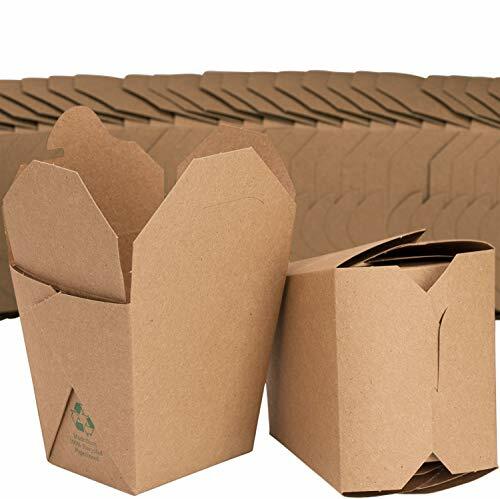 Made out of environmentally-friendly, chlorine-free kraft paperboard, this container ensures quality, single-service use and conveniently nests with multiple containers for compact storage. Its poly-coated interior also offers a grease-resistant barrier that prevents oil from soaking through and creating leaks or messes. Disposable for easy clean up, this Fit Meal Prep box is the perfect addition to any busy family, restaurant, convenience store, or food truck! Overall Dimensions: Length: 8 1/2"Width: 6" Height: 2"Capacity: 49 Ounce100% satisfaction guarantee - contact us if not satisfied with our product and we will send you a new replacement or issue you a full refund. Easily package to-go orders with this Fit Meal Prep kraft microwavable paper take-out container! Featuring an attractive and convenient design, this container is perfect for boxing up both hot and cold foods. Not only is its size big enough to house full meals, sides and desserts, its tab-lock top also ensures your signature items remain contained and safe from germs or airborne contaminants while in transport. 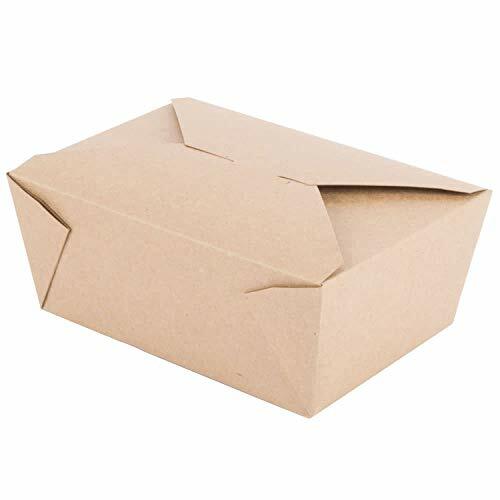 Made out of environmentally-friendly, chlorine-free kraft paperboard, this container ensures quality, single-service use and conveniently nests with multiple containers for compact storage. Its poly-coated interior also offers a grease-resistant barrier that prevents oil from soaking through and creating leaks or messes. Disposable for easy clean up, this Fit Meal Prep box is the perfect addition to any busy family, restaurant, convenience store, or food truck! Overall Dimensions: Length: 8 1/2"Width: 6" Height: 2 1/2"Capacity: 71 Ounce100% satisfaction guarantee - contact us if not satisfied with our product and we will send you a new replacement or issue you a full refund. 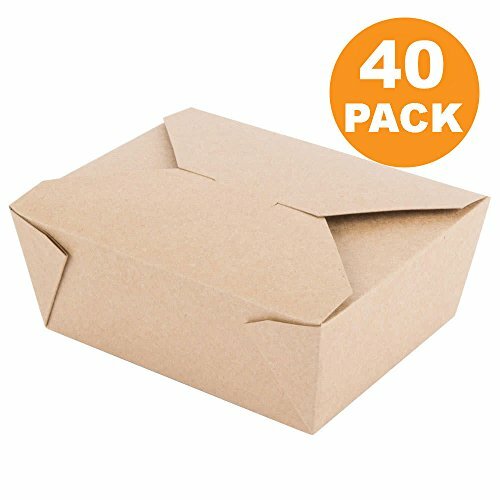 Microwavable Brown Chinese 16 oz Take Out Boxes. 50 Pack by Avant Grub. Stackable Pails Are Recyclable. Ideal Leak And Grease Resistant Pint Size To Go Container For Restaurants and Food Service. Keep Food Fresh and Keep Sauces From Leaking Out of The Box. 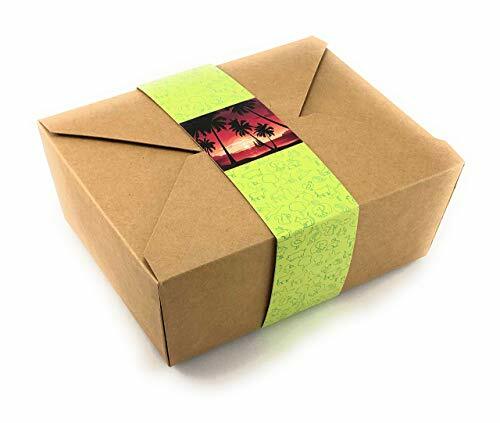 Serve your customers their to go orders in our boxes to ensure they get the same taste and texture experience they would at your restaurant when they get home. Our grease and leak resistant boxes will keep the foods hot, fresh, and ready to eat making sure customers come back for more. No More Incorrect Orders Our premium takeout boxes are fully writable. Keep a marker handy to write down customer names and what food is in the box to ensure your customers always get what they asked for. Show Your Creativity Add candy, ribbons, marbles, or other colorful pieces to the kraft paper colored backdrop to create lovely gift boxes for weddings, parties, or showers. The perfect addition to a DIY event. What's In the Box? 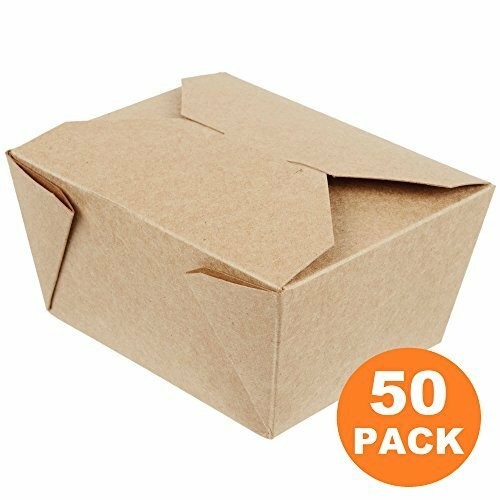 You will receive 50 - 16 oz stackable takeout boxes. Lifetime 100% Money-Back Satisfaction Guarantee! If you aren't completely satisfied with your order, simply reach out to us through the Amazon messaging service and we will respond within 24 hours to make it right even on the weekends. We absolutely guarantee your satisfaction or your money back! 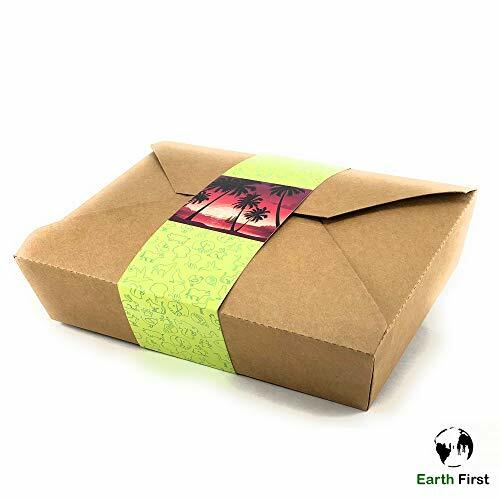 Easily package to-go orders with this Fit Meal Prep kraft microwavable paper take-out container! Featuring an attractive and convenient design, this container is perfect for boxing up both hot and cold foods. Not only is its size big enough to house light meals, sides and desserts, its tab-lock top also ensures your signature items remain contained and safe from germs or airborne contaminants while in transport. 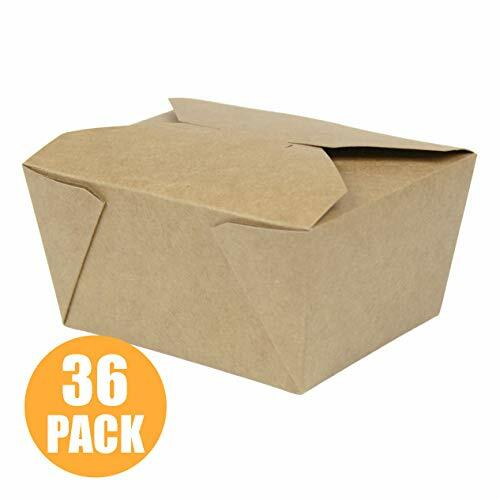 Made out of environmentally-friendly, chlorine-free kraft paperboard, this container ensures quality, single-service use and conveniently nests with multiple containers for compact storage. Its poly-coated interior also offers a grease-resistant barrier that prevents oil from soaking through and creating leaks or messes. Disposable for easy clean up, this Fit Meal Prep box is the perfect addition to any busy family, restaurant, convenience store, or food truck! Overall Dimensions: Top: 5" x 4 1/2" Bottom: 4 3/8" x 3 1/2" Height: 2 1/2"